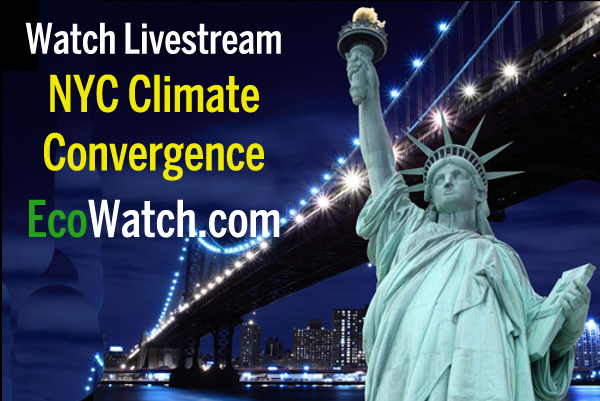 WATCH LIVESTREAM: NYC Climate Convergence – The Warm Up to People’s Climate March on EcoWatch! Home > 2014 > September > WATCH LIVESTREAM: NYC Climate Convergence – The Warm Up to People’s Climate March on EcoWatch! As environmental activists pour into New York City for Sunday’s People’s Climate March,expected to be the largest climate action in history, some climate advocates will already be there participating in the NYC Climate Convergence, a conference advocating for “people, planet and peace over profit,” Sept. 19-21. EcoWatch will be livestreaming many parts of the event courtesy of @StopMotionsolo, so if you can’t get to NYC, be sure to stay-tuned toEcoWatch. Subscribing to EcoWatch’s Top News of the Day is the best way to stay connected. Organizers of the Convergence are billing it as an “alternative summit” intended to strengthen and grow the environmental movement by addressing the underlying social and economic causes of the climate crisis and including all types of voices, not just those of the select world leaders attending the UN Climate Summit in NYC next Tuesday. Panels, workshops, performances, meet-ups and speeches will be taking place all over Lower Manhattan, engaging artists, activists, communities leaders, academics, writers and artists as well as ordinary citizens from all over the world, exploring how a more just society and climate protection go hand in hand. There are too many events for us to list—or for a single person to attend. But you can access a full schedule here. Here are a few highlights. The opening plenary takes place Sept. 19 at 7 p.m. at St. Peter’s Church, 619 Lexington Avenue. Speakers include Bolivian water rights activist Oscar Olivera, Philippine trade union leader Josua Mata, hip hop artist Immortal Technique, executive director of the Global Justice Ecology Project Anne Petermann, Nastaran Mohit from the New York State Nurses Association and Erica Violet Lee from indigenous peoples justice movement Idle No More. Riverkeeper and Waterkeeper Alliance will host a panel, “The Climate Crisis Is a Water Crisis,” on Sept. 20 from 10:40 a.m. – 12:15 p.m. at St. Johns University in Room 112. Hudson Riverkeeper Paul Gallay will moderate an all-star panel of leaders and experts on the climate-water nexus, talking about how water warriors are battling climate change from the Himalayas to the Hudson Valley. Bread and Puppet Theater, started more than 50 years ago to combine social and political activism with avant-garde theater, will perform its Anti-Tar Sands Manifesto Pageant, described as “an outdoor pageant with caribou, the tar sands monster and Christopher Columbus,” on Sept. 20 at 4 p.m. at El Jardin Del Paraiso Community Garden on East 5th, between avenues C & D.
The closing plenary on Sat., Sept. 20 at 7 p.m., also at St. Peter’s Church, will feature notedShock Doctrine author Naomi Klein, whose new book This Changes Everything: Capitalism Vs. The Climate sums up the conference theme. She’ll be joined by 2014 South African community organizer Desmond D’Sa, Olga Bautista from the Southeast Side Coalition against Petcoke and Jaqui Patterson from the NAACP Environmental and Climate Justice Program.